Ausdents offer hail dent removal in Perth to a wide range of vehicles that have recently been effected by hail or bad weather in the metropolitan area. Our hail damage repair services are extremely popular not only because they’re all mobile, but they will also save you time and money. Our hail damage repair in Perth is also an ecofriendly way to remove any unwanted dents on your vehicle caused by bad weather as no chemicals or re-spraying is involved. When you choose Ausdents you can rest easy knowing that you’ll also be doing your bit for the environment! Our mobile hail dent removal services are any easy way to increase the value and overall appearance on your vehicle and are a great way to get your vehicle back to its original form. Here at Ausdents, we try our very best to ensure that your vehicle is back to its original form by removing the hail damage, however depending on the angle and depth of the dent on your vehicle, it may be harder to remove dents were the metal is too stretched. 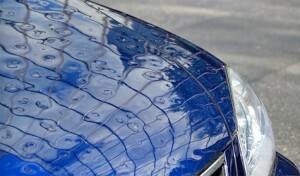 Removing dents from your car can be a tough job especially if you’re trying to keep its current paint. Thankfully, our team at Ausdents have many years of experience removing dents carefully without damaging the paint through a process called PDR (Paintless Dent Removal). To remove dents from your car, we will usually lower the roof, bonnet and boot liners to get access to the rear of the panel. We will then illuminate the outside and use stainless steel rods to push and massage the dent from the inside. We will also occasionally tap down to bring the metal back in line. Help us to assist you by providing any photographs of your vehicle’s hail damage, this will give us an insight into the depth and angle of the dents. For any queries or for a free quote regarding your vehicle’s hail damage repair in Perth, contact Ryan today on 0439 919 638.